Rating: 5 absolutely brilliant, shining stars! I read I Am The Messenger by Markus Zusak years ago. I must have been in 8th grade, so yeah about 7 years ago, and I really enjoyed it. It was a really unique story that I definitely never forgot, and I knew this book would be the same. Everyone who has ever read it has raved about it, but I just never picked it up for whatever reason (didn’t want to read something sad, already had too many books on the go, etc). Now that I have read it I honestly could not be more filled with regret that I didn’t read it sooner. I could not speak a bad word about this book if I tried. Everything about it was perfect. At first I was a little weirded out that we were reading from death’s perspective, but after a couple pages I realized it actually made the story a lot more interesting. At the beginning of the story Liesel Meminger is 9 years old and has more reason than most to be angry with the world. She has just lost her brother to Death and she is being taken to Munich to live with a foster family during the war. As a young girl she has no idea what it means to be a communist (like her mother and father) or to be a Jew (like Max), but soon she begins to understand. It really isn’t a surprise that she resents her foster mother Rosa, and she gets into trouble at school and fights with other children. However, thanks to her foster father Hans she begins to learn to read and finds her passion in words. All of the characters in this book are so beautiful and well developed. Rudy, Liesel’s bestfriend and first love, is so adorable and such a great sidekick of her to have in her book thievery. Hans is incredibly caring and wonderful to everyone he encounters, even when he knows he’s putting himself in a bad place because of it. It really is no wonder Liesel loves him and looks up to him the way she does. Even Rosa, who is annoying and mouthy at times, definitely grows on you throughout the book. It’s really beautiful to see how all of the characters in this book grow in some way because of their relationship with Liesel, and how Liesel grows and changes because of her relationship with books and words. The writing. Oh dear god, the writing. 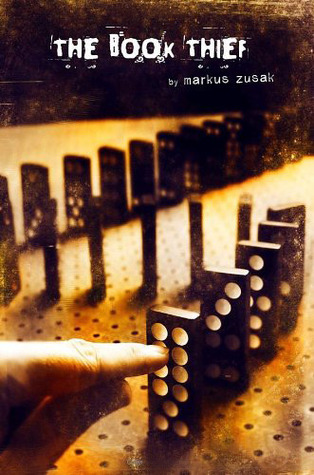 Markus Zusak has so much talent. This book and it’s metaphors and imagery will stay with you for a very long time. When I finished reading I couldn’t stop thinking about this book, it grabs a hold of you and does not let go. I don’t even know what to say other than this book was so powerful and wonderful and I can definitely say I will be revisiting it in the future. If you have not yet picked this book up, WHAT ARE YOU WAITING FOR?! Do not be like me and cheat yourself of this story for any longer than you need to. Read it now. Phenomenal story, beautiful characters, amazing imagery, and a heart-wrenching ending that will leave you wondering if Markus Zusak is a human or a literary god. Kim Kardashian’s ugly-crying-face doesn’t even compare to mine at the end of this book. The movie was also really well done, if you have read the book and haven’t seen the movie I suggest checking it out. However, it really doesn’t do the book justice so do not skip the book for the movie! The thing that makes me want to read this book the most is that the narrator is Death. Okay, I definitely have to move this up on my to read list! I love character driven books where the friendships play a large role in the story. I’m just scared about the sad part! Yes, you definitely have to! All of the other amazing things about this book definitely out way the sadness and the potential cry factor, and Death being the narrator is one of those things! I feel like once you get into it you will really enjoy it.